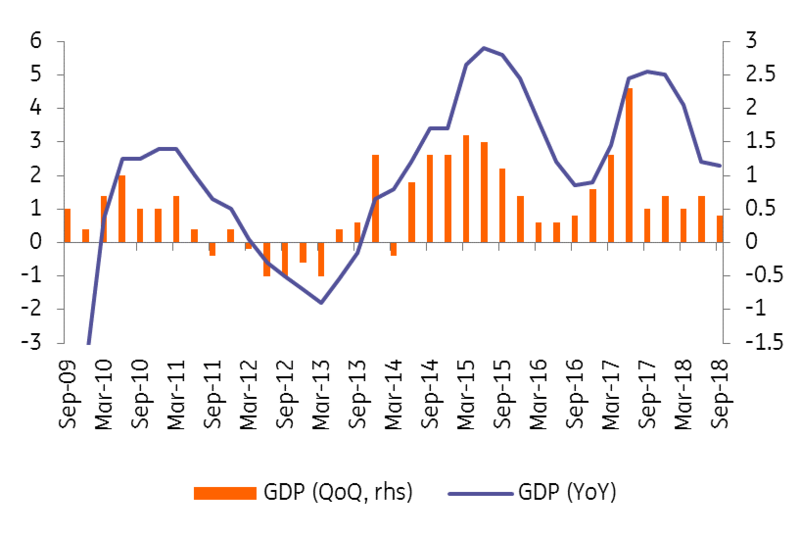 3Q GDP ended below both the market and Czech National Bank estimate (2.6/2.7% YoY). No details have been released yet; they will be available at the end of November but the Czech statistical office (CZSO) noted that growth was driven by both domestic and foreign demand, though mainly household and government consumption. Weaker than expected investment activity. This is often a volatile, hard-to-predict item due to government investments related to EU funds withdrawal. In 2Q, government investment accelerated by more than 20% YoY but might not maintain such a pace in 3Q. Last but not least, emission norms impacted the whole car segment in 3Q in the EU, which was also visible in German GDP growth in 3Q. This was below the market consensus, reaching -0.2 QoQ. This is the first QoQ decline since 1Q 2015. Part of the story is related to the new emission standards starting in September, which hindered sales and production of many car models. This might also partially effect figures for the final quarter of the year but should normalise next year, based on expert opinions. All in all, we need to wait for detailed figures because the structure of growth will be important, mainly from the central bank's perspective. As weaker growth will most likely be related to volatile investments/inventories and household consumption should remain strong, this should be no game changer for our CNB policy outlook of gradual monetary tightening next year.